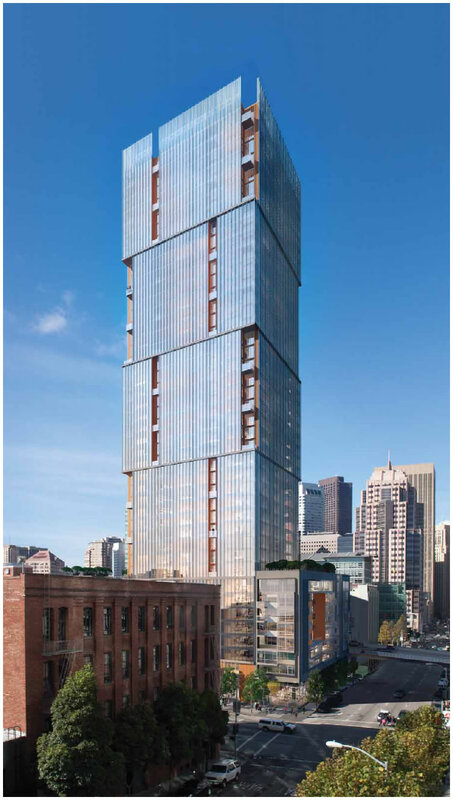 Essex Property Trust and TMG Partners are preparing to break ground earlier than expected for the 400-foot tower to rise at the corner of Folsom and First on Transbay Block 9. As we first reported last year, while the winning proposal for the Block 9 development had included 563 units of housing, of which 25 percent were to be below market rate, the project will now include a total of 545 apartments, of which 436 (80 percent) will be Market Rate and 109 (20 percent) will be BMR, distributed across the lower 21 floors of the 42-story tower and the 9-story podium. The BMR units will be available to households earning up to 50% of the Area Median Income. 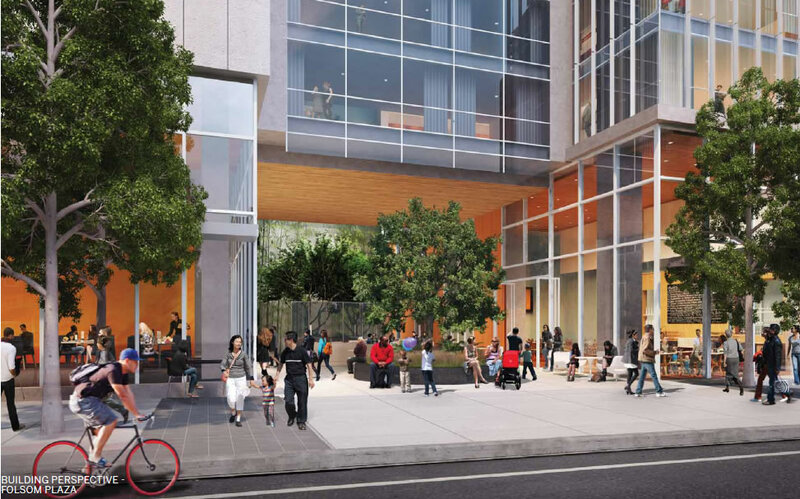 Nearly 7,000 square feet of retail and a 3,000 square-foot open space will occupy the ground floor of the development, with an underground garage for 206 bikes and 267 cars (including 3 spaces for car share and 3 charging stations). 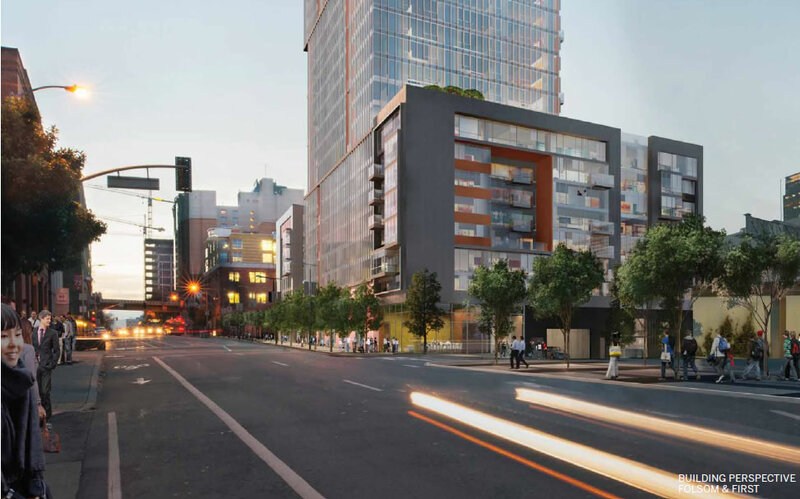 The development team paid $43,630,000 for the parcel and construction for the $240 million project is scheduled to take 38 months, which means the tower should be ready for occupancy by the end of 2018. Truly ugly. It reminds me of that billionaire Indian’s house in Mumbai. Eh, I kinda like it. At least it’s a bit different. I stand corrected. More like the Taiwan 101. Not really anything like that either. Want to try again? I agree, this is not at all like Taipei 101. I like both buildings. Restrained, pacific, elegant. Will scintillate in the light. Even if that’s not a word. And it’s not anything at ALL like the Mumbai billionaire’s house in the sky. Love it. Build the Mofo. Wonder if they are starting early to stave off a potential lawsuit to stop the project? My favorite of the four residential towers to line lower Folsom. There will be an utter transformation of the street and creation of a whole new neighborhood over the next 3-4 years. However, there is the matter of that awful PG&E substation across the street at Fremont /Folsom. Anyone know of any plans to somehow make it a less unattractive, hulking presence? I’m assuming it cannot simply be moved or somehow otherwise eliminated and note they are even now constructing a new small fiber optic transmission facility next door. The PG&E Embarcadero Substation serves North Beach to ATT Park, including the FiDi and Chinatown. PG&E has been making major upgrades to it over the past few years to increase capacity and reliability, including laying a submarine power cable from the switch yard near pier 70. That substation will probably be there decades from now. The major fiber optic facilities nearby are the ATT NAP at Folsom and 2nd and 365 Main. The sub station is an incredibly strong piece of design. We’d be lucky if any of the buildings came close to that level of sophistication. Should be landmarked. It will be transformed into something, but not a neighborhood. More like drone storage sector. This is actually one of the few towers going up that I really like. The other being the Gang tower whose fate is unknown. Build it! 21 floors in the tower and 9 floors in the podium will be 109 BMR units, which means that only the upper 20 floors will have 436 market rate units. Something’s not right here. Market rate and BMR on the same floor? Interesting. I wonder if this will have a poor door and separated hallways. Incredibly ugly, but wow what they can do with empty shipping containers these days. Not necessarily saying it’s ugly, but stacked shipping containers were the first things coming to my mind too. I’ve seen some really nice “stacked shipping container” buildings! Actually, it kinds grows on you if you look at it a while. Build it. Another wall in the water on the waterfront! Release the Kraken! Kidding. I love it. Something quirky in ultra conservative San Francisco. I’m just waiting for the orange and dark gray color phase to end in the city. Ironic that many of the towers away from the Bay are not building to their full zoned height while the Gang tower closer to the Bay wants to exceed the zoned height. Who is the architect? That will influence how the building turns out. If it’s Pelli, it might be beautifully done. 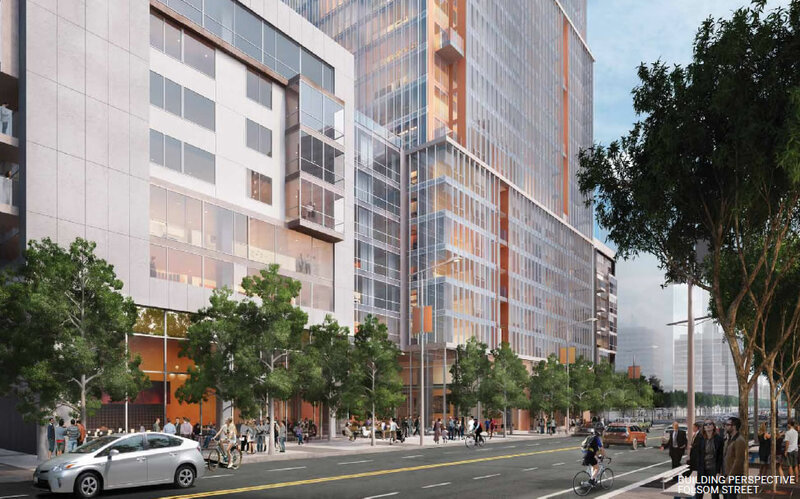 If it’s Arquitectonica, it will be a mess – as demonstrated by the disappointing Trinity project.